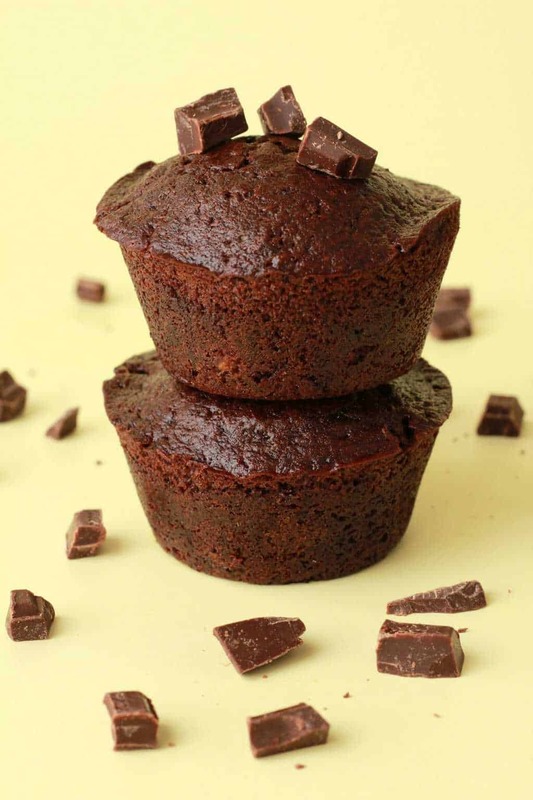 OH the double chocolate chocolatey deliciousness is here! 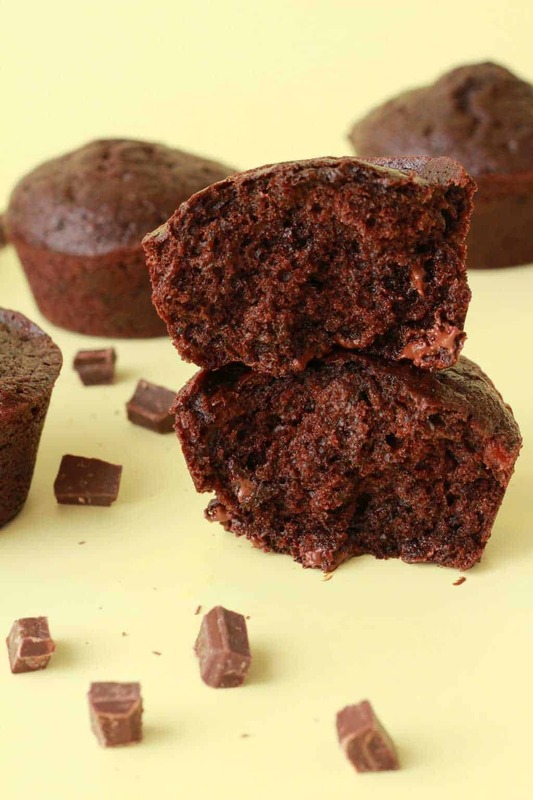 Vegan chocolate chocolate chip muffins at your service! 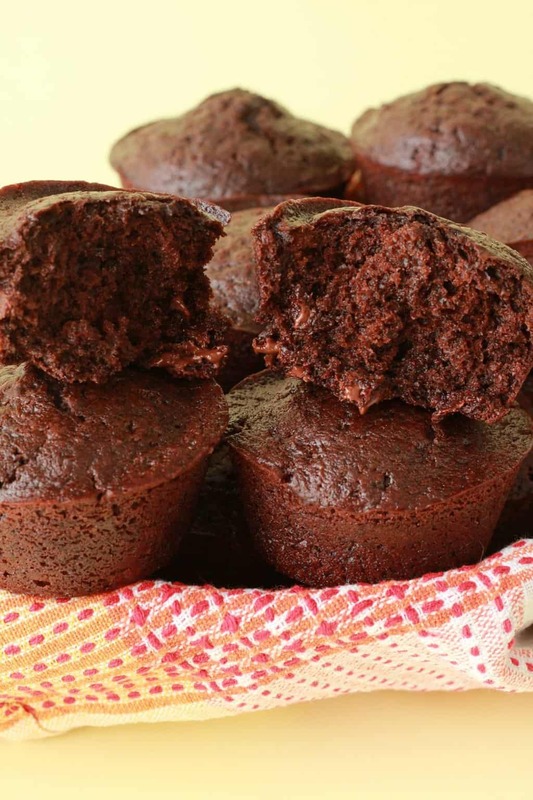 Deliciously warm fudgy brownie style muffins that is. 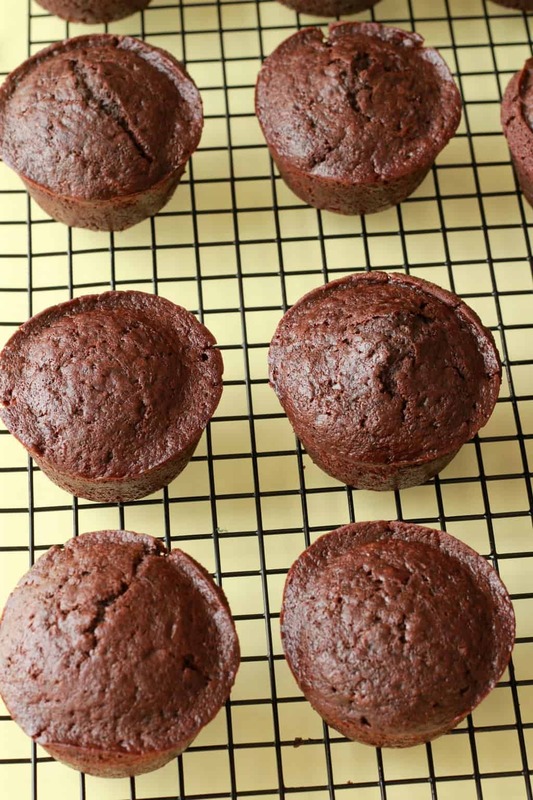 These chocolate chocolate chip muffins are so easy, there’s not even a troubleshooting guide. It’s not like blueberry muffins where you have to make sure the blueberries don’t sink, in this case, the chocolate chips stay put! In my case I used chocolate chunks cut directly from a slab of vegan chocolate. I just can’t find chocolate chips in this part of the world. But chocolate chunks work fine! You just have to have some patience to cut them! I wanted to make a slightly ‘lighter’ version (and really, I do mean slightly) so I swapped out half the coconut oil for applesauce. Just delicious! They taste like fudgy brownies actually. And when they’re still warm from the oven you have melting chocolate inside, soooo good. All that and they’re even a ‘little’ lighter too! It’s a win/win! Have ’em for breakfast, have ’em for lunch, have ’em anytime! 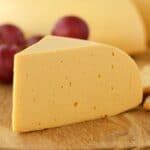 Keep them covered at room temperature where they will stay fresh for a few days. 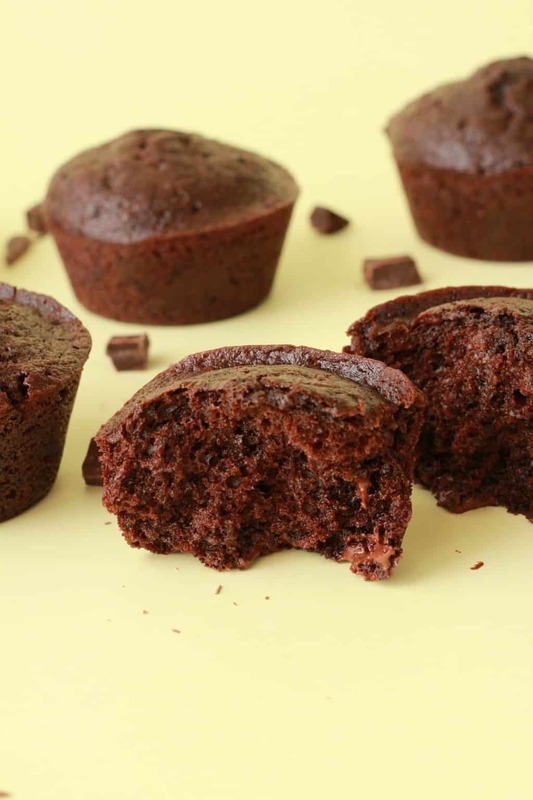 So let us know what you think of these vegan chocolate chip muffins! Rate the recipe and leave us a comment! And tag any pics #lovingitvegan on instagram so we can check them out! And while you’re here – sign up for our email list! 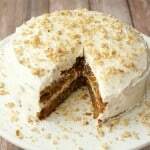 You’ll get an awesome free recipe ebook, and you’ll stay updated with all our latest recipes! 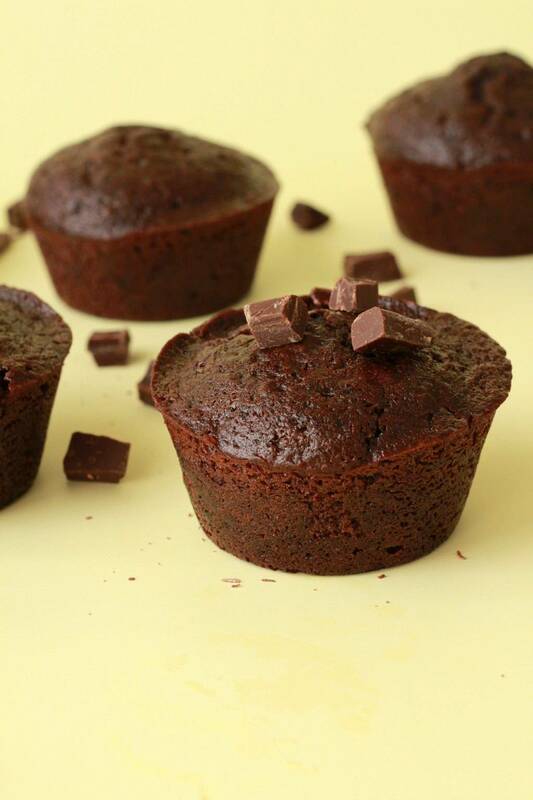 Fudgy brownie style vegan chocolate chocolate chip muffins. 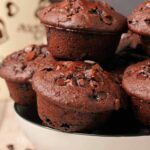 These chocolate muffins stuffed with chocolate chips are insanely delicious and quick and easy to make! 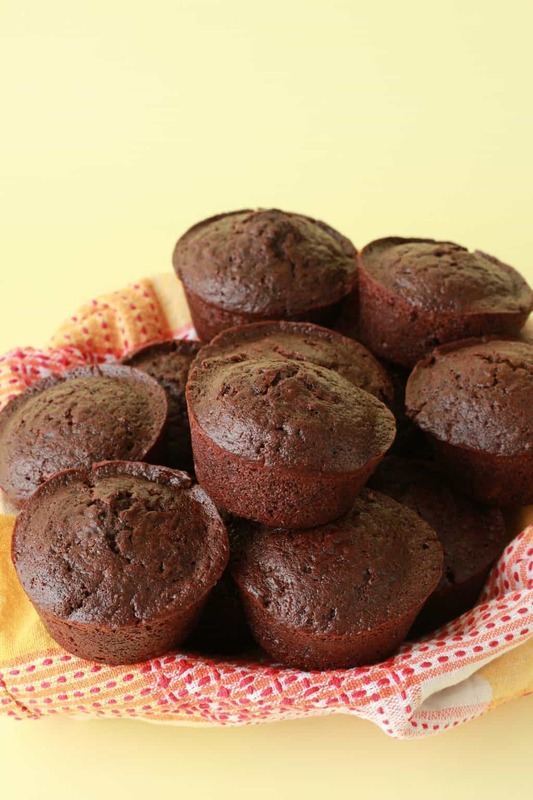 Sift the flour and cocoa powder into a mixing bowl and add the brown sugar, baking soda and salt. Then add the soy milk, vanilla extract, coconut oil, applesauce and vinegar and whisk together with a hand whisk briefly. Add in the flax egg and whisk it in. Chop the vegan chocolate into small chunks roughly equivalent in size to chocolate chips, or just use chocolate chips if you can get them. Throw in the chocolate chunks/chips and fold in. 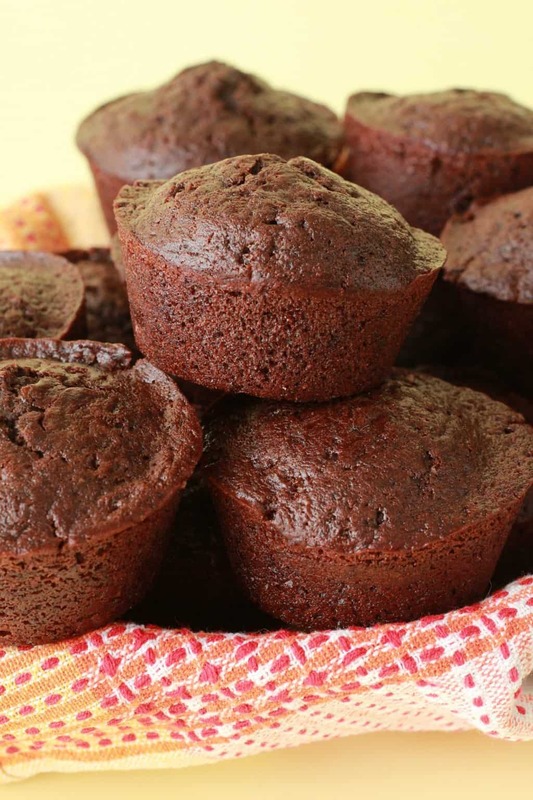 Spray a muffin tray with non-stick spray and divide the batter evenly between the muffin cups. Allow to cool in the trays for 10 minutes before transferring them to a wire cooling rack. I am so happy I found your recipes. I added pecan and was great. Thank you! 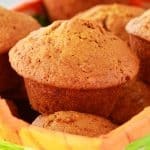 This recipe is the best vegan muffin recipe I’ve come across. I’m gluten free as well and just replaced the flour with SR gluten free flour and it worked perfectly. 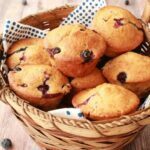 I’ve just made a 3rd batch but swapped the cocoa with ground almonds, and the choc chunks with fresh raspberries, and added the grated rind of a lemon – and hey presto delicious lemon and raspberry muffins. So glad I’ve found this recipe! I am so happy I found your recipes. Thank you for this recipe. 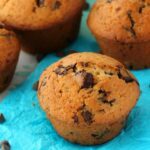 These muffins were delicious – even my son who says he’s not keen on vegan food went back for seconds! 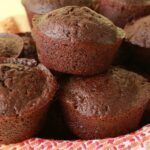 Best chocolate muffin recipe I’ve ever made! So delicious! 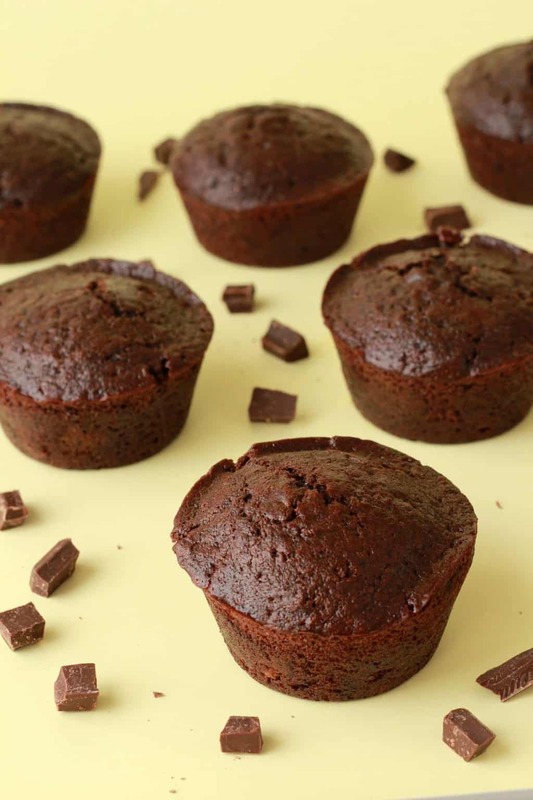 I added a table spoon of decaf coffee I had on hand to the batter to enhance the rich chocolate flavor and they turned out amazing. Thank you! Hi I’m Not Vegan But I Am Lactose Intolerant Could I Replace The Flax Egg & Apple Sauce For Real Eggs? Made these with my girls today on a rainy Saturday afternoon. Huge success. Didn’t have any applesauce so I doubled the coconut oil. Also used a real egg in place of the flax one, not vegan obvs, but it worked out perfectly. 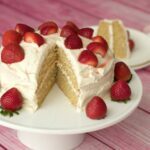 I just love all your recipes, Alison – they are explained so beautifully and are super easy to follow. I really appreciate having the measurements in weight as I feel like that’s the easiest way to get precise quantities. Also love the fact that most recipes are simple and contain mostly in-the-cupboard ingredients; fits in with real life!! Even though my husband (the vegan in our family for whom I first started using your recipes) has now added fish & eggs back into his diet, I still regularly use your recipes. They’re just great, not just “great for vegans”. Our friends always rave after sampling something of yours that I cook. Thanks for all your efforts – they’re certainly a huge gift to our kitchen!! Hi, just made these now…wow! They had the crunchy outside of a brownie and a soft, delicious inside. I used 1/2 cup of applesauce, no coconut oil, and ground up some oatmeal for the flour. Baked for 17 minutes. Perfect! Thanx. These are soo good! Thank you for this recipe! 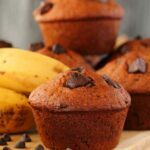 One of the best vegan muffins recipes seriously! I have made a few not so successful batches from other recipes, and so happy this finally works! It’s so encouraging. I’m going to keep making. Maybe go lighter on the sugar. Thanks so much! 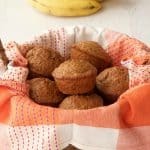 These are my go to quickie muffins! 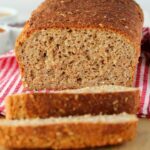 I get lazy and often skip the flax egg but they turn out great anyway. Thank you for sharing! !